SolTerraLog: Are Your Passwords Protecting You? The more sites you’re signed up to, the more likely you are going to rely on the same few passwords to access them. That’s a lot of sites and a lot of ways for someone to access your account information if they discover any of your passwords. What you don’t want to happen is a domino effect, where cracking one account means that you can access all of them. Creating a unique password for every site you’ve signed up to is one of the most effective ways to protect yourself. Create passwords that are easy to remember but hard for thieves to crack. Include numbers, capital letters and symbols. Use a $ instead of an S or a 1 instead of an L. $1ngle is NOT a good password, hackers are onto this one, but you could come up with a phrase such as (My 1st child Luke was born in 2001) and use the initial of each word like this M1cLwbi2001 or (My friend Sue is a very nice girl) Mf$1avng. These are excellent passwords. 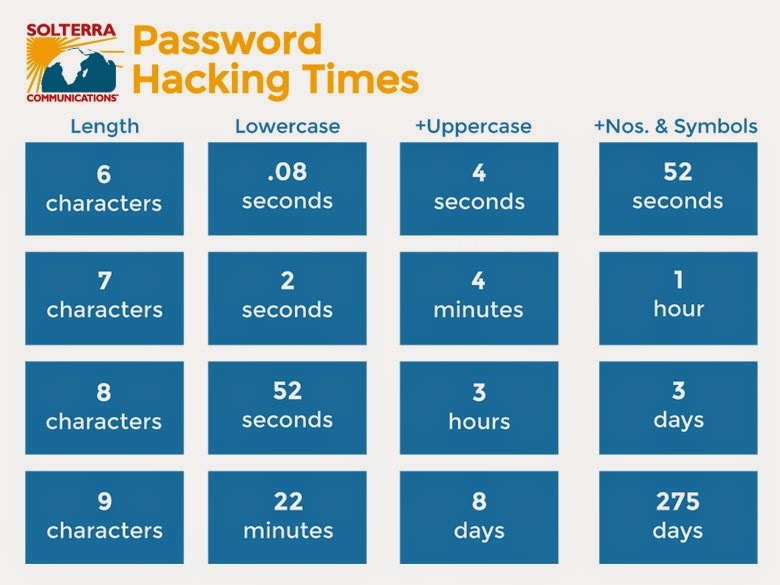 Longer passwords take more time to crack so the longer you can make it, the better by combining words or characters that you can remember. Don't use dictionary words. If it’s in the dictionary, there is a chance someone will guess it. There’s even software that criminals use that can guess words used in dictionaries. Consider using a password manager to add an extra layer to your password protection. Services such as RoboForm (Windows only) or Lastpass (Windows and Mac) let you create a unique very strong password for each of your sites. As well as remembering and storing them in your Web browser, it ensures that all your accounts are protected and only requires you to use the one master password to access them. Password combinations tested using howsecureismypassword.net.